"What is the difference between German Rottweilers and American Rottweilers?" The most obvious difference is that the German Rottweilers now have tails. German breeders must breed in strict compliance to the standard. Their dogs must pass a breed suitability test and have their hips certified before breeding. American breeders are not required to test their dogs before they breed. American bloodline Rottweilers typically do not meet the breed standard. They do not have the structure or temperament of a correctly bred (German) Rottweiler. 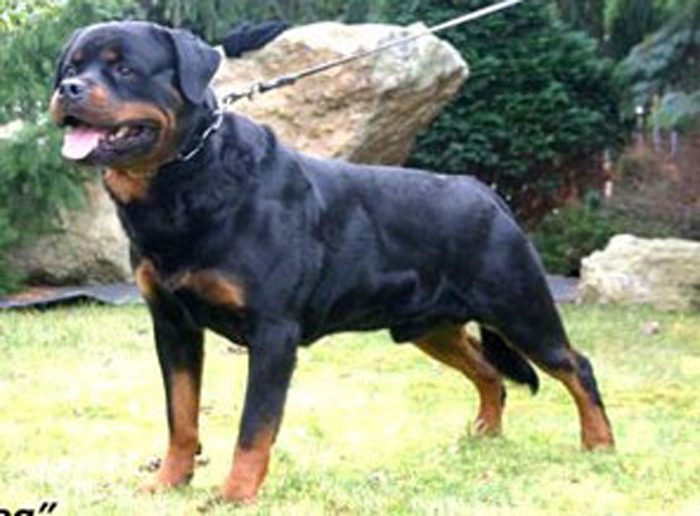 A true Rottweiler exemplifies breed type, possesses a stable temperament and has strong working ability. The Rottweiler should be free from inheritable diseases such as hip dysplasia. In Germany , both parents of a litter must be temperament tested (BH title), breed tested (Ztp) and have their hips certified. One parent must be Schutzhund titled. These stringent requirements eliminate lesser quality dogs from the gene pool. ADRK breeders are required to use Dogbase before they can breed a litter. Of course, not every German dog is superior. Many German dogs exported to the U.S. as adults are "rejects" and are not typical of the quality found in Germany. An experienced importer such as vom Aztlan Kennels should be consulted by people wishing to import a top quality German dog. In the U.S., a litter of puppies may be registered without any fitness for breeding tests. The American Kennel Club registers pups from any Rottweiler combination (assuming both parents are AKC registered). The parents may have bad hips, missing teeth, yellow eyes, white spots, or weak temperament. This is why the overall quality of American bloodline dogs is very poor. The majority of strictly American dogs are no longer true Rottweilers. These dogs do not meet the Breed Standard, despite having American Championship titles. Many are oversized with very light eyes, pink mouths, missing teeth, wrinkly heads, unstable temperaments and NO working ability!! A dog that cannot pass a breed test, temperament test or obtain a Schutzhund title should NOT be bred. The Rottweiler is a working breed. The Rottweiler is always ready to work and will protect his family without being unpredictable and dangerous. The Rottweiler is a loyal friend and eager to please. We maintain these traits in our kennel by breeding only from the finest German bloodline dogs. At. 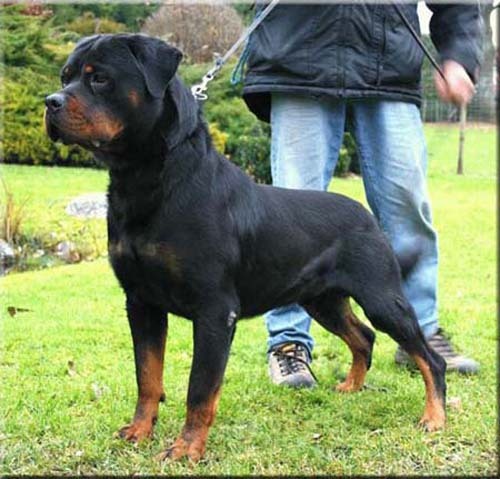 Vom Aztlan Rottweilers strives to produce a sound German Rottweiler with exceptional conformation and high drive. A German Rottweiler was bred first and foremost for a clear stable temperament. Our Rottweiler Puppies that we produce are bred with the same intent as the ADRK German Breeders. Beware of breeders in the US who tell you they breed German Rottweilers. Many European breeders are no better than Americas backyard breeders. Most European countries do not have required breeding standards; hence, their breeding programs are inferior to German bred Rottweilers. Only German born dogs have been bred by the strictest standards in the world. Remember that many breeders will tell you that European Rottweilers or European bloodlines are the same or equal to German bred Rottweilers. We take this task of helping you in determining what temperamental attributes are best suited to your current living situation very seriously. It's our obligation as breeders to aid you and our puppies in a correct placement. All homes are interviewed to assess their needs and to determine the appropriate temperament type for their situation. All of our puppies receive Early Neurological Stimulation and are formally temperament tested. Our dogs are confident and temperament tests to be kid friendly. Our male Rottweiler puppies for sale. Our female Rottweiler puppies for sale. There are times when older puppies or adults are available to loving homes even if they are not listed. A purchase price of a puppy is only a fraction of the costs a responsible dog ownership entails, and we feel those who are unable or unwilling to afford a quality puppy will not be willing or able to afford quality care. Bargaining over a puppy or an adult dog is absolutely not acceptable in our kennel. We have two upcoming Rottweiler litters for sale. We hope you'll enjoy your visit and stop back by soon as we are always adding new pictures of our adults and Rottweiler puppies and information and articles about the breed. We breed Rottweilers that can live in any home and competitively compete and campaign at shows and working fields here, in Europe, and the world. Rottweiler puppies for sale come with AKC registration, health guarantees, hip guarantees, copy of sire and dam pedigrees, legal contract, and Rottweilers can be sent world wide. All our Rottweiler puppies and adult Rottweilers are family raised with our three children. In our Rottweiler breedings, we strive to produce Rottweiler puppies with correct conformation, excellent temperament, good bone substance, and extraordinary heads. Our goal at VAR Rottweilers is to better the Rottweiler breed by producing top quality, sound Rottweiler puppies. With over ten years of Rottweiler breeding experience, we offer German Rottweiler puppies for sale from the best European Rottweiler bloodlines around the world, including the finest ADRK German Rottweiler studs.